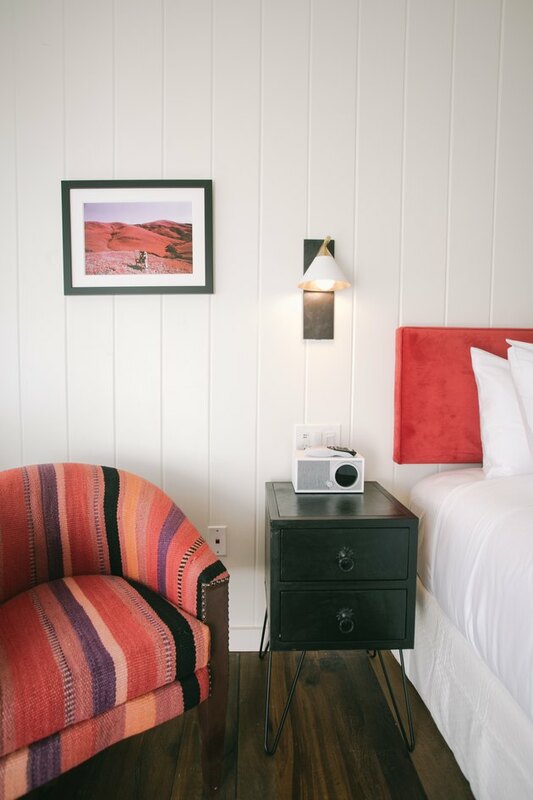 In a world where hidden gems are harder and harder to find, discovering the '50s-era roadside motel that would be reborn as the Skyview hotel was a rare stroke of luck for husband-and-wife team Kimberly Walker and Mike Kyle of the Nomada Hotel Group. "Some friends of ours told us about it and thought, 'Oh, this is in their wheelhouse,'" says Walker, speaking of the property in Los Alamos, California. "We love taking old properties, refurbishing them, and giving them new life." 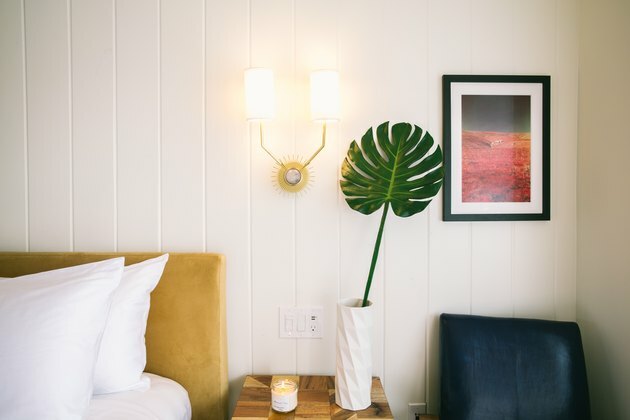 It's a passion already reflected in the group's other two hospitality businesses, Granada Hotel & Bistro in San Luis Obispo and Cambria Beach Lodge in Cambria. "We literally just fell in love with it. We put an offer on it as soon as we saw it," recalls Walker. 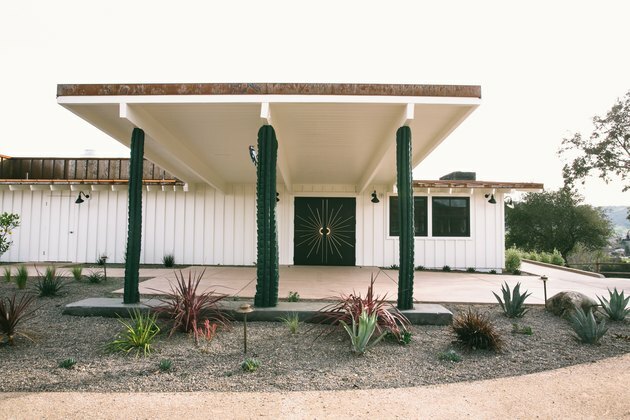 The couple immediately began restoring the five-acre property back to its midcentury roots, but with of-the-moment updates like eclectic global finds and rustic touches. 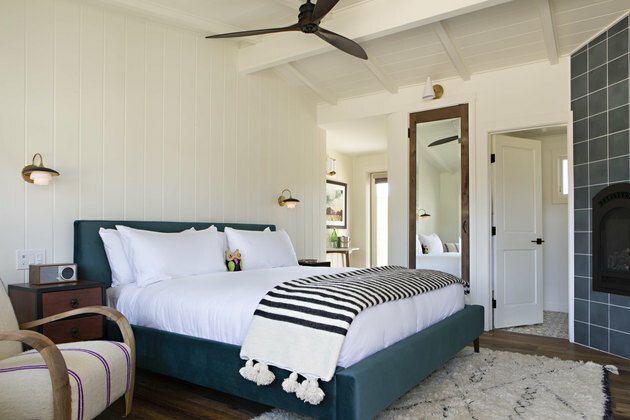 In April, they reopened Skyview, which today draws style-minded travelers to Santa Ynez wine country. Even now, they marvel at their good fortune. "We had driven by Skyview so many times but never went up the hill," says Walker. "You just don't find properties like that anymore." 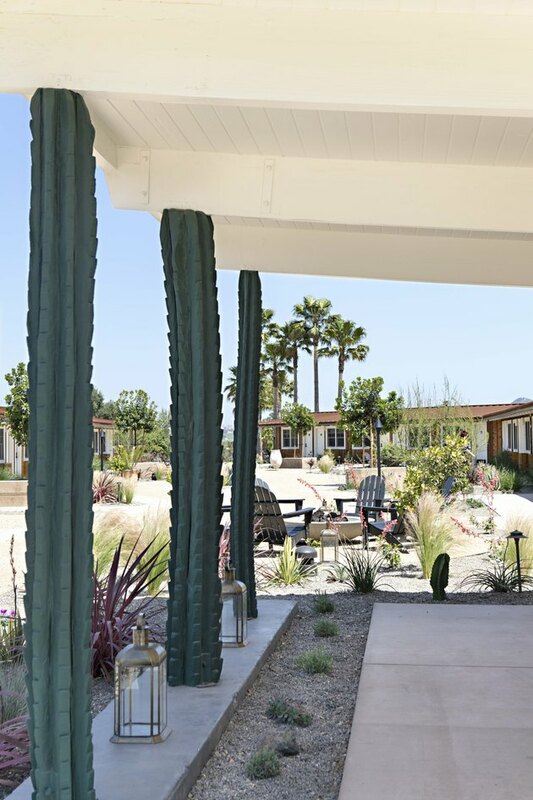 The motel's original porte-cochère was dressed up a bit with faux-cactus pillars, desert-chic plants, and double doors painted black with a gold midcentury-mod starburst. While slightly kitsch, they decided to keep those details. "They were part of the original building, but really in disrepair," says Walker. 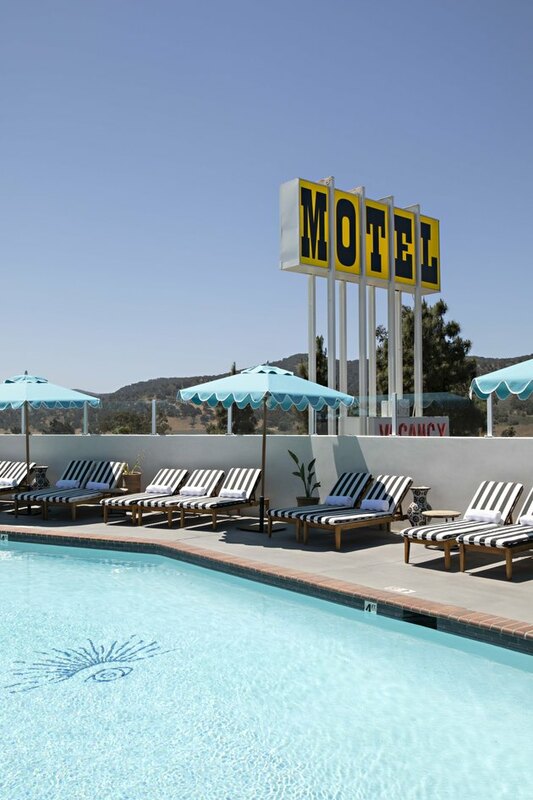 Retaining the retro motel sign helps tell the history of this "new" property. Minimalist design in the pool area includes chaise lounges with chic black-and-white striped cushions, potted plants, and turquoise umbrellas as colorful accents. In one of the rooms, a single Monastera leaf in a heavily textured white vase is joined by white vertical shiplap walls and a framed photograph designed to inspire wanderlust. Red cliffs in the framed photograph bring out similar hues throughout the room, while dark wood flooring contributes to the space's warmth. All the rooms feature interesting plays on texture and color. In this Deluxe Room, velvet, shag, wood, and tile work together to create a cohesive design. 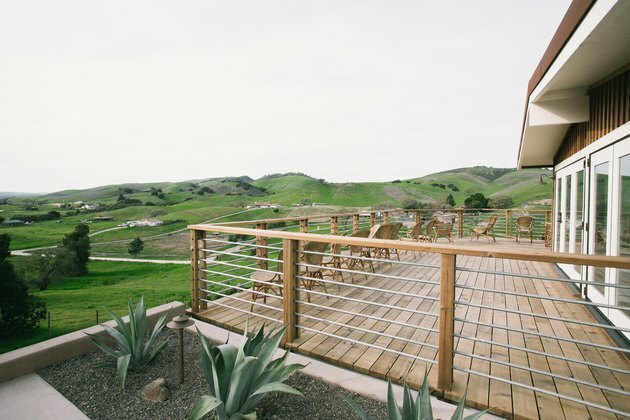 The hotel's new look includes a large, modern wood deck that celebrates the expansive views. Designed to create community among guests, the fire pit is surrounded with comfy Adirondack chairs to kick back in. 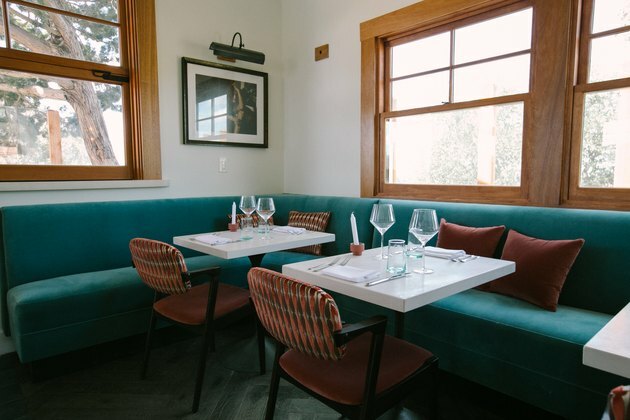 Norman, the hotel's restaurant, mimics a living room vibe, with gallery lighting above the artwork, picture windows, plush fabric banquettes, and a palette of saturated teal and brick red tones.